Looking for carabiners? Check out our Buyers Guide! Just like simple gates (mostly on quickdraws) and the well-known pear-shaped HMS-carabiners, locking carabiners are also a part of every climber's equipment. Below you can find some notes on the different variations of locking carabiners. Locking carabiners come with classic screw locks or combined closures such as a rotatable screw lock. No matter how sophisticated such mechanisms might be, they can be very impractical to handle as well. Beginners, especially, should rather go for simple locking carabiners. Ice climbers should also check whether the carabiner can be opened with gloves on or in a slightly iced condition. With a little practice, you will soon be able to use these kinds of locking carabiners with a rotatable screw lock more quickly and easily. 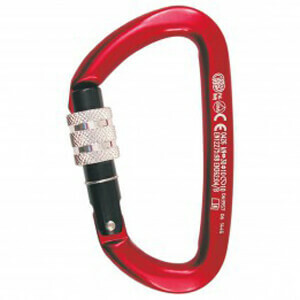 There are locking carabiners, which resemble small HMS carabiners in shape. Due to their special curvature they offer great protection against transverse load caused by twists. Moreover, some versions also have a wire to protect against any accidental twisting. If you like climbing long routes or routes with traverse, you can also apply locking carabiners with an integrated rope pulley in order to reduce friction.